Are you coming to Coffee Fest in March of 2016? This show is going to be fun! 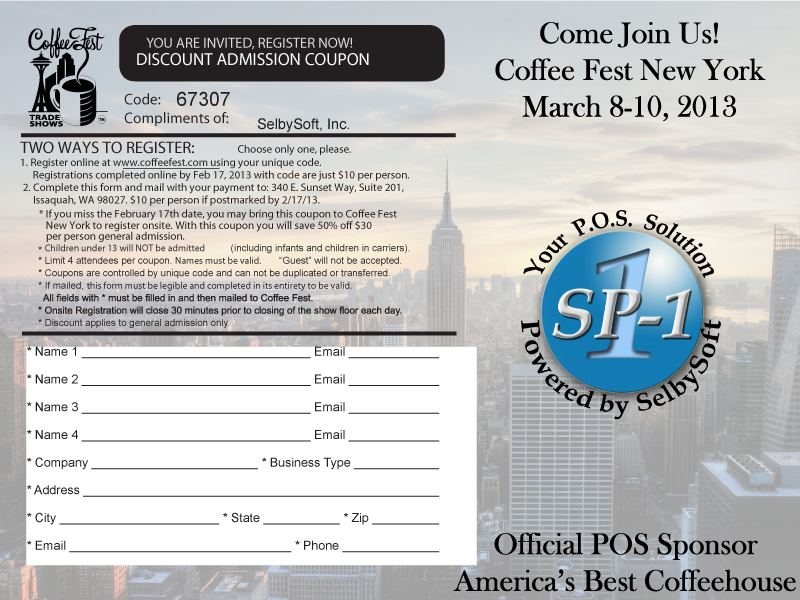 SelbySoft will be showing off our coffee and cafe point of sale system in booth 600. Mike will be presenting a “Tracking & Increasing Sales with Technology” seminar on Saturday the 12th. Don’t forget to check out the Best New Product competition on Friday as well. Mike & three other judges will be judging Shark Tank style as products are pitched 2 minutes at a time! Going to Coffee Fest in June? So are we! This show is a must for anyone that is in the Specialty Coffee industry. The show takes place June 5th, 6th and 7th at Navy Pier in Chicago. SelbySoft will be in booth 405 showing off all the latest point of sale technology. You can also see the SP-1 for Coffee POS in action as the Official Point of Sale for America’s Best Coffeehouse competition. Need some more information? Check out our presentation on Tracking & Increasing Sales with Technology on Saturday the 6th. Our team will be in Atlanta Georgia this week for the Coffee Fest trade show. This show takes place February 6th, 7th and 8th and is held at the Cobb Galleria. Come visit us at booth 405! The SP-1 for Coffee point of sale system will also be featured as the official POS for America’s Best Coffeehouse competition. Are you heading to Portland OR in October for the Coffee Fest show? Here are some tips I’ve picked up over the years that might help you make it an enjoyable show. Think about why you are coming to the show. It seems simple but having a plan can help you spend quality time at the show. Are you there to open your first coffee shop? Looking for equipment? Take classes or just to have fun and network? Take some classes! If you have not looked over the class list for Coffee Fest Portland than you are seriously missing out. Coffee Fest offers more FREE educational classes than any other show I attend. If you can’t make it to a class, don’t hesitate to ask the presenter for a copy of the educational materials. Make a quick run through first. These shows can be big. Take the time to make a quick run through and mark down any booths you want to spend extra time at. Don’t wind up missing out on some booths. Along with #3 – Plan it out. Every show has an exhibitor list online and in the show guide. Mark the people that you want to see. Coffee Fest Portland can be found here. Talk to people that are attending. You never know when you will run into another coffee shop owner that has a similar shop. The other owners at the show probably have run into the same issues you have. Not interested? Just say so! Every so often someone will stop by, ask for the sales pitch and then balk at having their badge scanned. If you are not interested in a product, just say so! Most of the exhibitors would rather not waste time following up if you are not interested. Along with #6 – Step outside the box. Stop in a booth or two that you have never visited. Ask about the product or for a short demo or sales spiel. Sometimes you might surprise yourself by finding a great product. Get your literature mailed. I’m convinced that a good percentage of the literature I had our is left in the hotel room. We know you want to make room for samples and coffee! Party! Maybe not in a bad way but definitely attend one or more of the industry functions held around Coffee Fest. It’s a great way to blow off some steam and network with vendors and attendees in a relaxed environment. Check out the competitions. Latte art, America’s Best Coffeehouse and Best Espresso are just a couple of the competitions that will be going on during the show. Just a quick blog post here to let you know that I and our sales staff will be at Coffee Fest in New York City on March 7th, 8th and 9th. If you happen to be in the area, come see us at the Jacob Javits Center. We will be in booth #226 and will be showing off the latest in hardware, software and POS features that SelbySoft has to offer. I will be speaking at this show as well. My speech is on Tracking and Increasing Sales with Technology. If you have seen it before, stop by and take a refresher course – I really try to mix it up every year and update our information for this class. That class is on Saturday the 8th at 10:05am. Finally, you have to stop by and check out the America’s Best Coffeehouse competition! We are proud sponsors of this innovative competition and it is amazing to watch the competitors give it their best at the show. Plus the winner of this competition will head to Portland at the end of 2014 to compete for $10,000! This is the last week to register for discounted Coffee Fest passes. This show takes place March 8-10 of 2013 in New York City! You can use the code 67307 to secure a 50% discount courtesy of SelbySoft. Click here to start your registration. Don’t forget to register for our Using Technology to Track & Increase Sales class Saturday the 9th at 10:05am. Finally stop by and check out the SP-1 as the OFFICIAL POS sponsor for the America’s Best Coffeehouse competition! Coffee Fest Chicago June 8-10th. This week we will be at the Coffee Fest show in Chicago from the 8th to the 10th. If you happen to be in the area, stop by! We are in booth 707 & 709! Mike Spence will be hosting a seminar on Tracking Sales with Technology at 9am on the 9th at the Chicago Coffee Fest as well. This week we will be at the Coffee Fest show in New York from the 9th to the 11th. If you happen to be in the area, stop by! We are in booth 224 & 226! Mike Spence will be hosting a seminar on Tracking Sales with Technology at 9am on the 10th at the New York Coffee Fest as well. Coffee Fest in San Diego! We will be in San Diego for the Coffee Fest this week. We will be gone from 6/2 to 6/6! If you are in town, look us up!